Just few ingredients, simple recipe but makes a delicious meal . 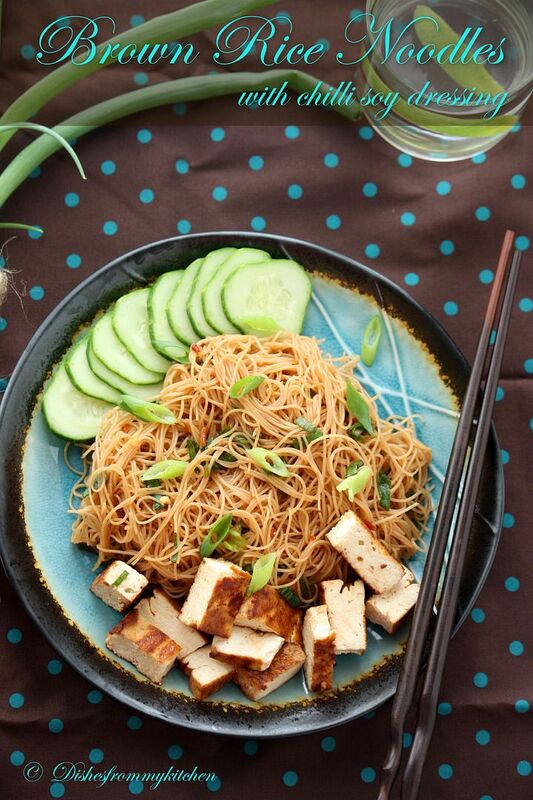 This can be made in no time, if you have marinated tofu ready. You can press and marinate the tofu a day ahead. 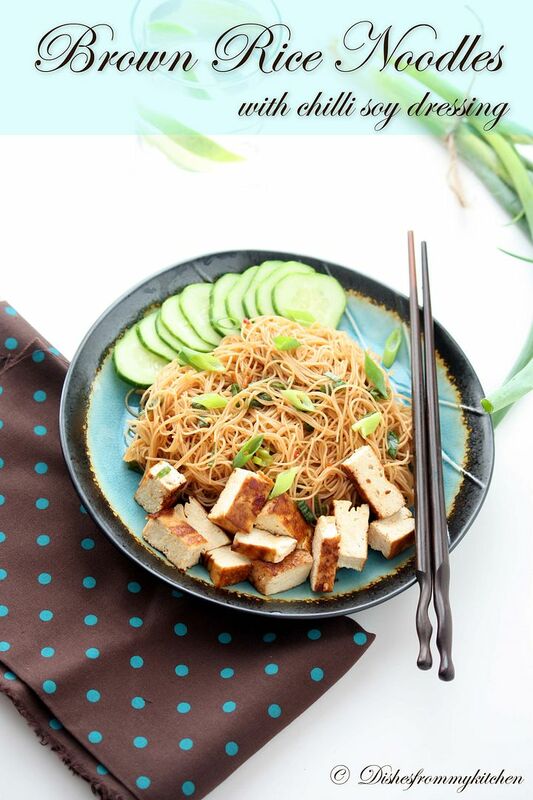 For this recipe I have used Brown rice noodles but you can use normal rice noodles as well. You can get this noodles at any supermarket in Asian isle or Asian grocery store. 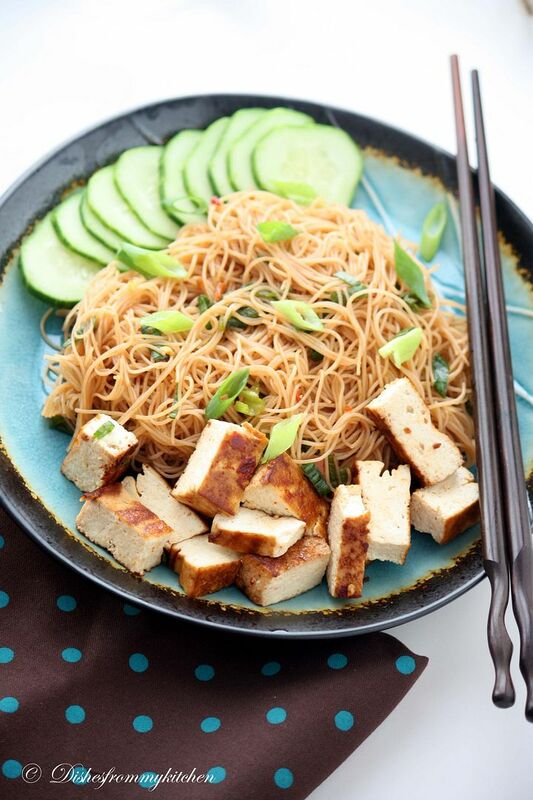 Use pure sesame oil for this recipe. Spring Onion - 2 stalk one for making the dressing another for garnishing. Salt as needed..as both soy and chilli sauce both has the salt in it. Drain the tofu without water, tap with the kitchen towel. Wrap the Tofu with using 3 to 5 kitchen towels (paper towel). Keep it in a plate and keep one more plate on the top of wrapped Tofu. Now keep a heavy weight on top of that plate. For me Morter stone works best. Let this sit for atleast 1 to 2 hrs. All the moisture from the tofu will be absorbed by the kitchen towel. And you will be left with pressed tofu with no water in it. 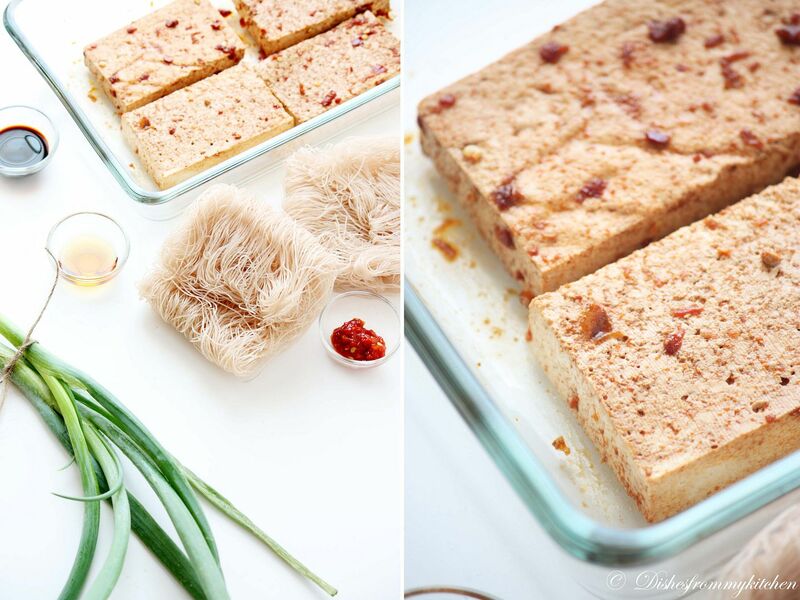 Cut the Tofu into 4 equal parts, both horizontally and vertically as shown in the pictures. Whisk the marinating ingredients in a separate bowl . Brush them in the tofu on all sides. Cover it and keep it aside for 2 hrs atleast. Pressing and marinating the tofu can be done a day ahead. 1. Heat the skillet, sear the Tofu on all sides until they are light brown in color. 2. Once it is done cut them into cubes. 3. Now slice 1 spring onion very finely. 4. To this add the sesame oil, chilli garlic sauce,Soy sauce and little salt. whisk it. 5. To this add the cooked Noodles give it a nice toss until everything is well blended. 6. Serve it with seared Tofu and slices of Cucumber. The noodles need not be hot. This can be served in room temperature. Love noodles....this looks tempting and mouthwatering...wonderful presentation and fantastic clicks. Absolutely my kind of food! Lovely recipe, Pavi!! pavithra, why dont you give the link to your winning page announcement post, once clicked on your dmblgit badge? 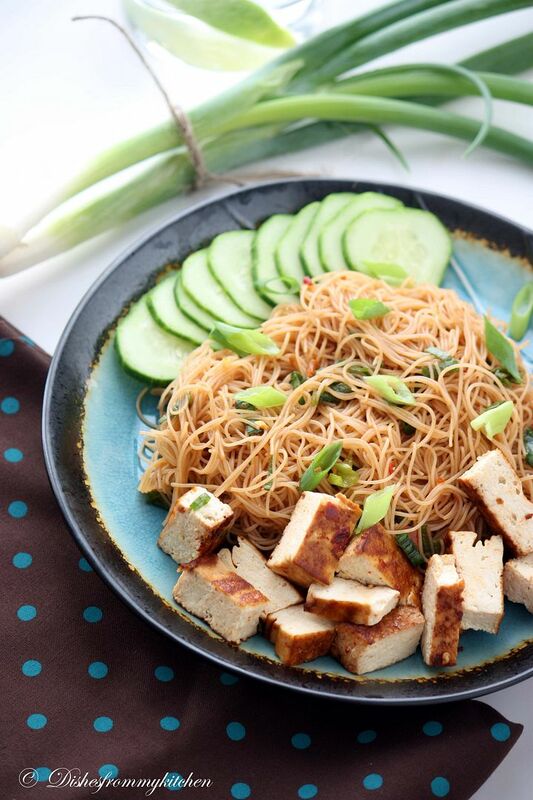 I love, love rice noodles and have all the ingredients for this in my kitchen except Tofu. 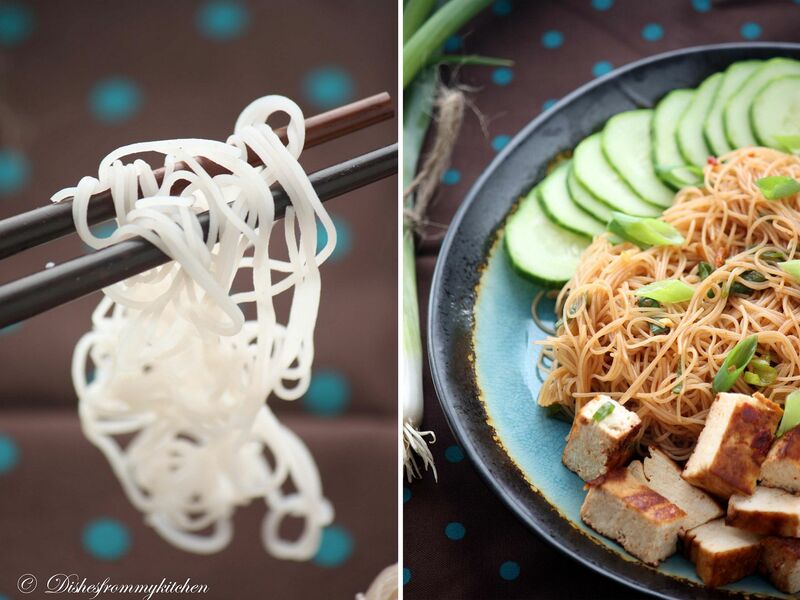 I bought rice noodles a long time ago and they have just been sitting in the kitchen, maybe waiting for this recipe! Also love your chopsticks, the nice curves at the end. Absolutely stunning pics nice recipe. healthy and nutritious dish. amazing clicks as usual. Im so in love with this!!!! Love the dressing too...Looks so inviting!!!! Great recipe with the most wonderful photographs. I love the chopsticks! an awesome recipe with my favorite ingredients! love the flavor of sesame oil how i wish I could have this one for lunch. Looks immensely good. What an inviting dish which is making me real hungry pavi. Lovely dressing too. beautiful recipe. not fussy but beautiful flavours. looks perfect for a light lunch. Hmmmmmmmmmmmmm I want to eat this now itself. This is so inviting and great comfort food. Love the mind blowing pics and awesome dish. You are a creative and talented person. wow, this looks awesome..feel like having some..wonderful clicks.. Absolutely wonderful ~ something I can eat on regular basis! Wonderful platter, seriously i can have this marvellous noodles with those fabulous tofu bites anytime.. Such an inviting platter .. loved all the pictures. Great dish! we will all love it.Lovely lovely pictures! This one looks so fresh, yummy and easy to make...can't wait to taste it! The pictures look life-size and is popping out of the screen. Beautiful shots and recipe, as always! Love those noodles..The pictures are gorgeous! That is a delicious looking plate. 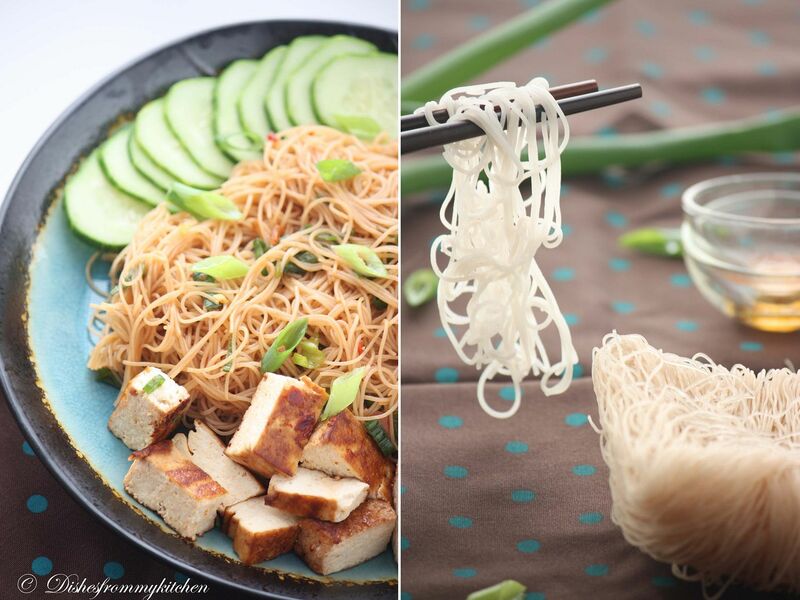 I never made rice noodle at home but should definitely give a try . I need to look out for brown rice noodles in the grocery stores. Quality Management Standard 9001 is world’s most recognized quality certification standards. Qsindia is a leading ISO Certification Company in India, providing ISO 9001 Certification & Consultants, quality certification standard Products services in India.